What would Paramount’s Star Trek film franchise look like had they launched with Star Trek Beyond instead of J.J. Abrams’ slick counterfeits? We’ll never know how much better it would be, but at least we finally have a film that acknowledges the substance of Star Trek instead of merely grafting its modernized aesthetic onto generic action movie plots. Star Trek Beyond is the trekkiest of the films set in the so-called “Kelvin Timeline,” mostly because unlike its Earth-bound predecessors it actually does go, if not quite boldly than at least with greater confidence, into the unknown to seek out new life and civilizations. Set mid-way during the Enterprise’s 5-year mission, it positions the series where it was meant to be all along: out in space. Although the planet hosting the majority of the film’s action is just routinely beautiful, the film makes up for it with the stunning Yorktown, a majestic starbase whose cityscape twists and loops on itself, Inception-style, and looks every bit the futuristic ideal of civilization Roddenberry’s Star Trek strove to represent. Given the low standards established by the previous films, it almost doesn’t matter that Star Trek Beyond’s plot is ultimately revealed to be yet another revenge drama. The cast – always the new franchise’s strength alongside production design – is in its finest form, giving us an Enterprise crew worthy of representing the original thanks to focused and often funny script. (Yes, Spock’s romance with Uhura still grates. But it’s handled here with enough nuance to feel less like a stunt and more like a genuine relationship – and this is less critical than the surprisingly thoughtful interaction between Kirk, Spock, and McCoy as well as the introduction of a pleasingly tough new character, Jaylah, played with smarts and sass by Sofia Boutella, and Shohreh Aghdashloo’s dignified Commodore Paris.) Justin Lin achieves a brisk and exciting pace for the film, revving up the action scenes and deftly managing spectacular special effects while also letting the film breathe during its character moments. 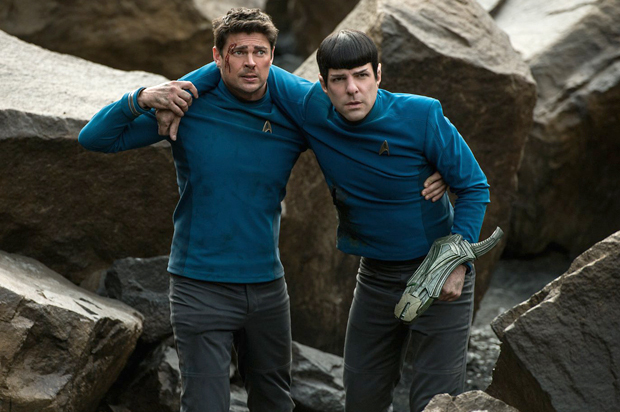 It does matter, however, that Star Trek Beyond remains mired in Paramount’s – and Hollywood’s – resistance to high-concept films, particularly in the science fiction genre, and preference for action to ideas. Like the recent glut of superhero movies demonstrates, there is the trend in the industry to look for conflict and drama only in situations involving violence and combat – a trend that has afflicted TV-to-film adaptations beyond Star Trek, like the Mission: Impossible series, as well as generally excellent higher-concept films like Edge of Tomorrow and Oblivion. Although very entertaining and a welcome throwback to some of the elements that made us fall in love with the Original Series, Star Trek Beyond presents us with a villain – Idris Elba under heavy makeup – reducible to a vengeful menace with an appetite for mass destruction. The idea that the Federation might meet opposition by alien races who view them as a colonialist rather than a cooperative force never gains traction as anything other than the stage on which yet another apocalyptic scenario is played. And in the end, just as Starfleet’s identity crisis in Star Trek Into Darkness’ somehow fit into the single character of Peter Weller’s warmonger, it boils down to a personal confrontation between Kirk and the villain. 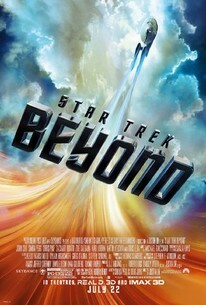 Lacking a majestic sense of grandeur – which only Star Trek: The Motion Picture succeeded in achieving among all the Star Trek films – as well as well as grand and grandly executed ideas, Star Trek Beyond’s by-the-numbers action-adventure plot just doesn’t stand alongside Star Trek’s best stories – like “Devil in the Dark” and” Encounter at Farpoint,” to name two of many. The lesson, then, is that the best science-fiction stories aren’t to be found in film but in television, which is rather sad given how different the cinematic experience is from the small screen. It comes down to economics, of course, and the cost of production that studios need to recoup even before profit is factored in. But what does it say that television, with its lower budget, can succeed at telling smart stories rooted in fiction about science while movies run the hamster wheel of exploding blockbuster action movies? If you’ve never done so, I suggest watching shows like Star Trek: The Next Generation, Star Trek Voyager, Odyssey 5, and FarScape. There’s a vicious cycle at play, in that studios don’t typically present audiences with beautiful and smart science-fiction films (Duncan Jones’ Moon and films by Neil Blomkamp being notable exceptions), so audiences don’t get exposed to what is possible and, consequently, don’t demand better than the usual action movie formulas. Yet there is also a technical element, in that visually demanding film productions don’t seem to have benefited from computers to significantly reduce costs and make it easier to depict strange new worlds – worlds limited by imagination rather than budget. Nevertheless, Star Trek Beyond certainly is fun. But I do wish people could see what the wonder and challenging social commentary science-fiction is really capable of offering. Thank you for reading and supporting independent critical writing. It does take time and effort to write, so while all content here is provided at no cost to you please, if you enjoyed today’s article, share it via your favorite social media using the share button below.